When I head that 60 of New Zealand’s smallest bird, Titipounamu (or Rifleman) were going to be introduced to my favourite sanctuary, Zealandia, naturally I got really excited! I have seen these tiny birds on Ulva Island, and at Pukaha Mt Bruce, but the prospect of having them so close to home and at Zealandia was something else. I was lucky enough to witness the release of a few birds, which was so special, they were incredibly fast out of their boxes (as you can see from the green blur photo) but I managed to get a far away photo of a female high up in a tree. To celebrate the arrival of the Titipounamu I created a new Illustration featuring a Male and and Female nestled in some Miro leaves. 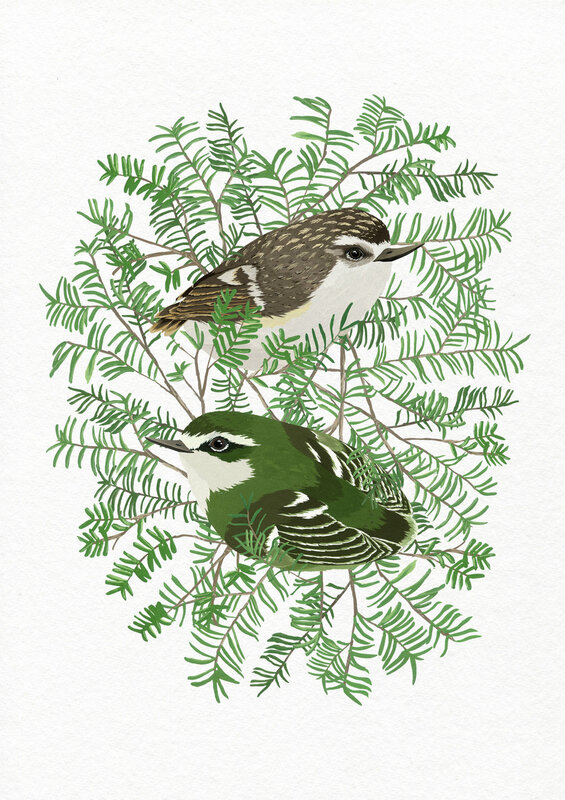 Prints will be available on my website very soon, but they’re already in the Zealandia gift shop. Since the release I have been to Zealand several times to try and spot them, I have seen glimpses of them but haven’t got close enough to get a decent photo, I’m going to keep trying though! Here are some photos of the official release I took and also images of my new illustrated prints, oh and a greeting card too!